Sorry for the delay in posting this. Apparently a driver hit an all-important cable and the whole county is without internet. Rural living can’t be beat! We’ve finished the hoophouse turnips, and are now making serious headway on the kale. We grow both Red Russian and White Russian kales. White Russian kale from Fedco Seeds in our hoophouse in March. 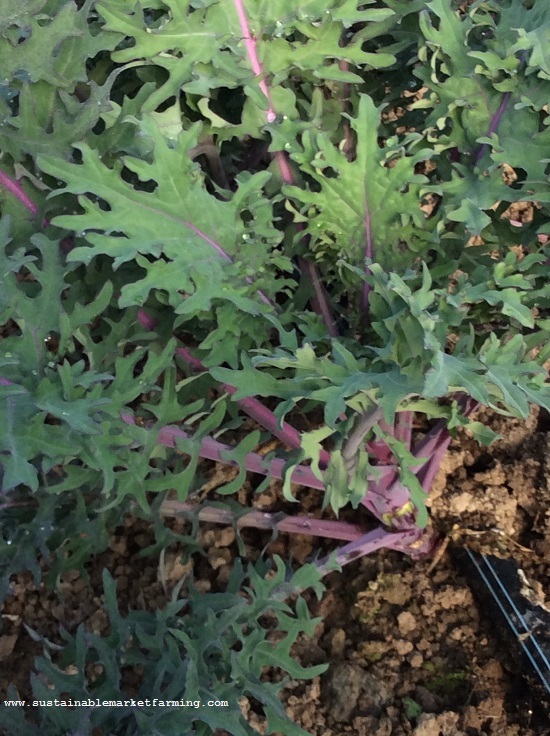 Red Russian kale from Southern Exposure Seed Exchange in our hoophouse in March. Baby lettuce mix after and before harvesting. 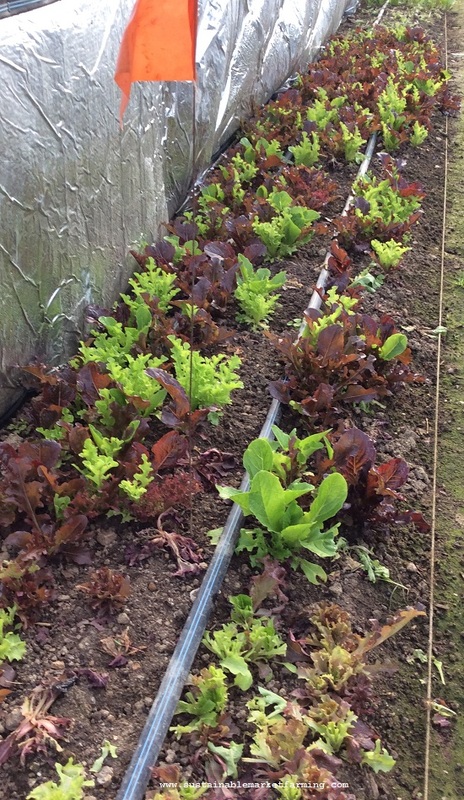 As you can see we harvest baby lettuce mix by cropping it about an inch above the soil. I think this is the third cutting of this patch. I like to make our salad mixes about one third lettuce, one third brassicas of some kind and one third spinach. The brassica mix below is now bolting, so I pulled it up as I harvested. 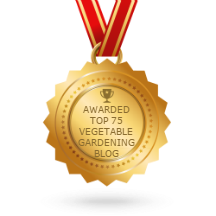 All brassica flowers are edible, and the buds are just like tiny broccoli. 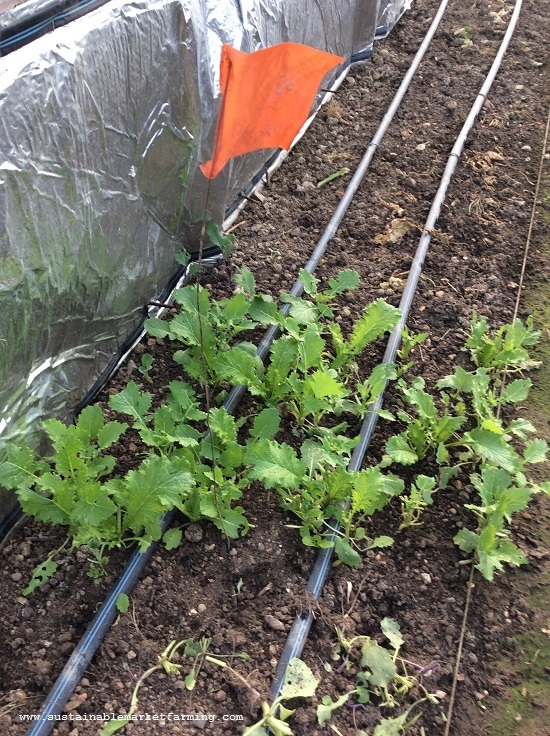 Brassica (mustard) salad mix after and before harvesting. The spinach I’m harvesting today is our third sowing, and we are cutting outer leaves and chopping them into the salad mix. 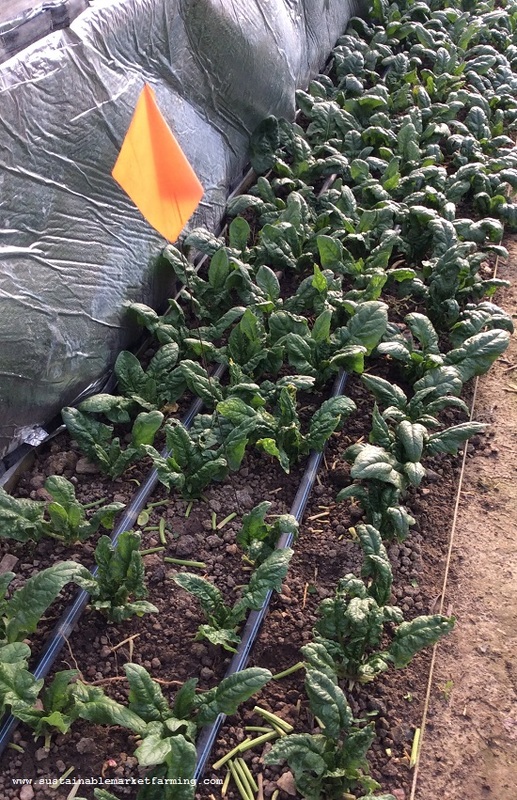 Spinach after and before harvesting. For those wondering what the silver stuff is: these three crops are all in our narrow north edge bed. We have 24″ (60cm) bubblefoil insulation stapled onto the hipboard. It reflects back both light (in short supply low on the north wall) and heat. In the greenhouse we have reached Peak Broccoli Flats season. We have 16 flats for our first planting in the coldframe, 16 of the second and four of the (backup plan) third sowing in the greenhouse. 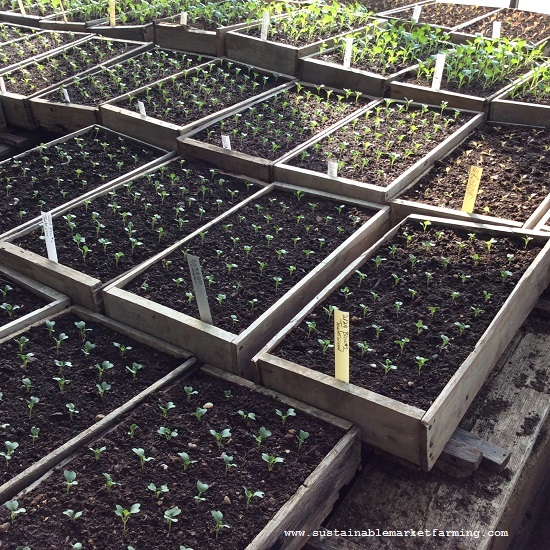 Some of the many flats of broccoli in our greenhouse in mid-March. 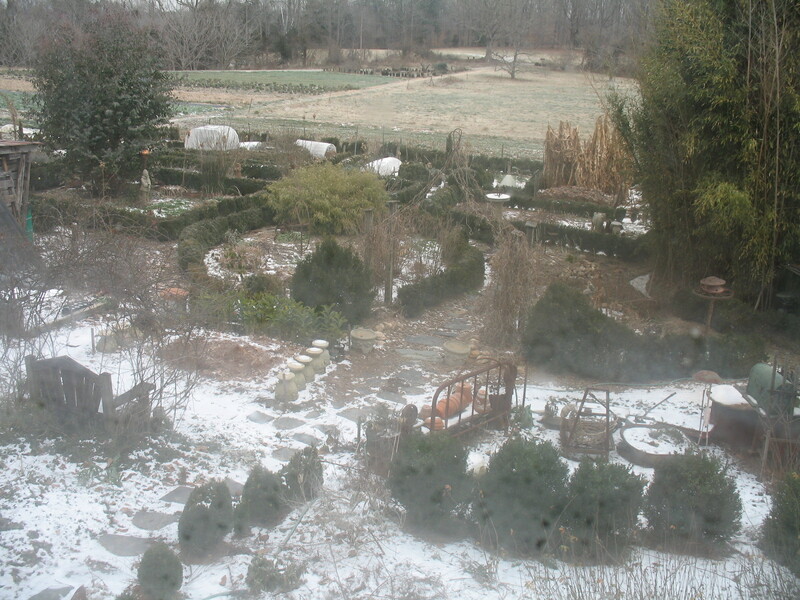 We use open wood flats for these kinds of hardy seedlings. We sow 4 rows into 12 x 24 x 3″ flats and then spot out into 12 x 24 x 4″ flats (40 plants each) to grow to final transplant size. Broccoli in an open seed flat, and seedlings spotted into deeper open transplant flats. That’s it for this week! Hope to see some of you tomorrow at the Virginia Festival of the Book! Yes, we’re still planting leeks! Later than we intended, but the soil is nice and moist, thanks to the recent 1.6″ of rain. We’re growing 180′ each of King Richard and Lincoln, fast-growing fall leeks, 360′ of King Sieg and 1080′ of the wonderful winter-hardy Tadorna. 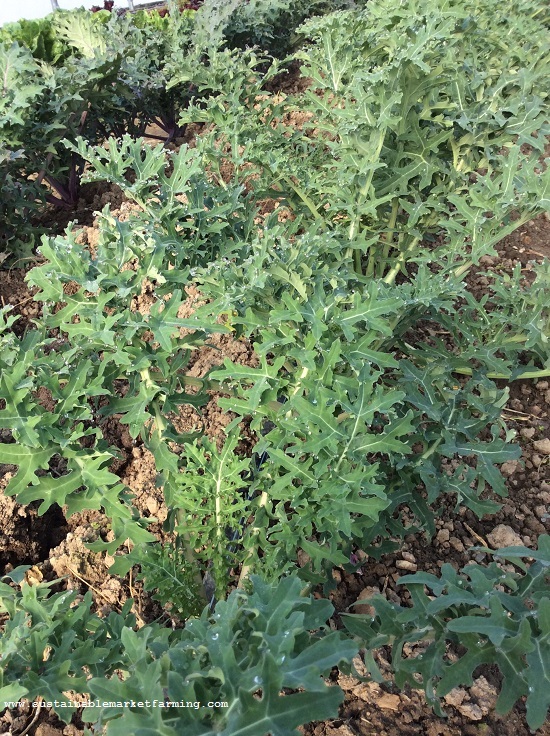 We’ve just got about 400′ of Tadorna left to plant. Maybe tomorrow we’ll get finished. 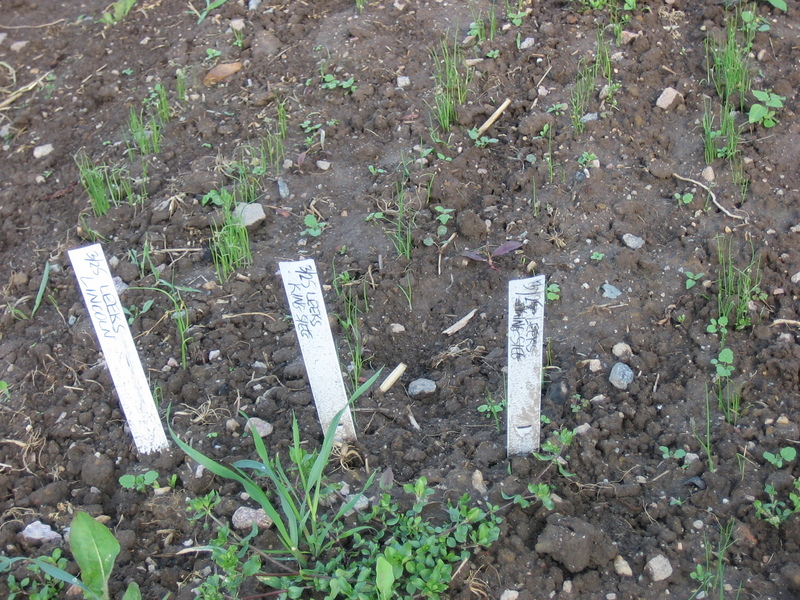 Leek seedlings in spring 2012, our usual method. Usually we grow our leek seedlings outdoors in a nursery bed. We reckoned to sow 24′ each of the fall leeks, 48′ of King Sieg and 144′ of Tadorna on 3/21, and repeat this on 4/27 as a back-up. 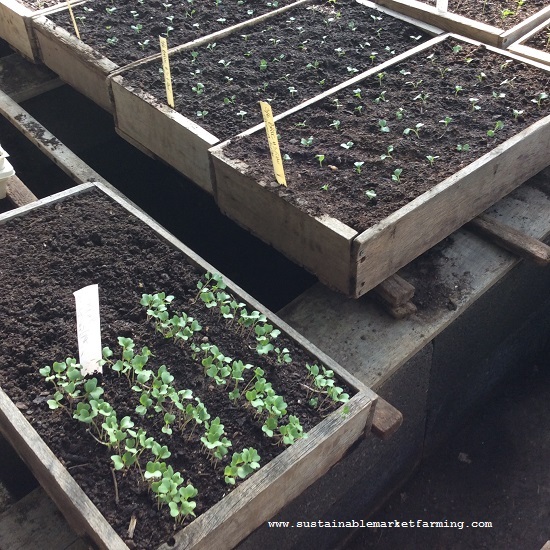 March had so much rain we couldn’t sow outdoors, so we used open wood flats, sowing the rows close together. Our flats are 12″ by 24″. To get the same number of plants, we sowed 6 rows across and needed a total of 20 flats. Quite space-consuming! The greenhouse couldn’t contain them along with all the other starts we have at that time of year, so we put the freshly sowed flats directly in the cold frames. Our logic was that the coldframe would be at least as warm as the conditions they would have had in the nursery bed. This worked well. There was coldframe congestion, which would have been even harder if we hadn’t been losing so many flats of broccoli to various beasts! On 4/27 we were able to make the second sowing in the outdoor nursery bed. The strange part of the tale is that we don’t seem to need them! Using flats has given us a much better survival rate than the nursery bed used to (sometimes it’s a challenge dealing with the weeds that pop up and outgrow the slow leeks.) We even seem to have had too many plants in the twenty flats. I’m strongly considering switching over to deliberate use of flats next year. I think we could even sow fewer flats (reducing the coldframe congestion). A disaster has produced a better method! Our, our creativity when faced with a disaster has produced a better method. With our “new” method, we still put the seedlings in small buckets of water to make the roots stick together for easier planting. The ideal size for transplanting is between a pencil lead and a pencil in thickness. 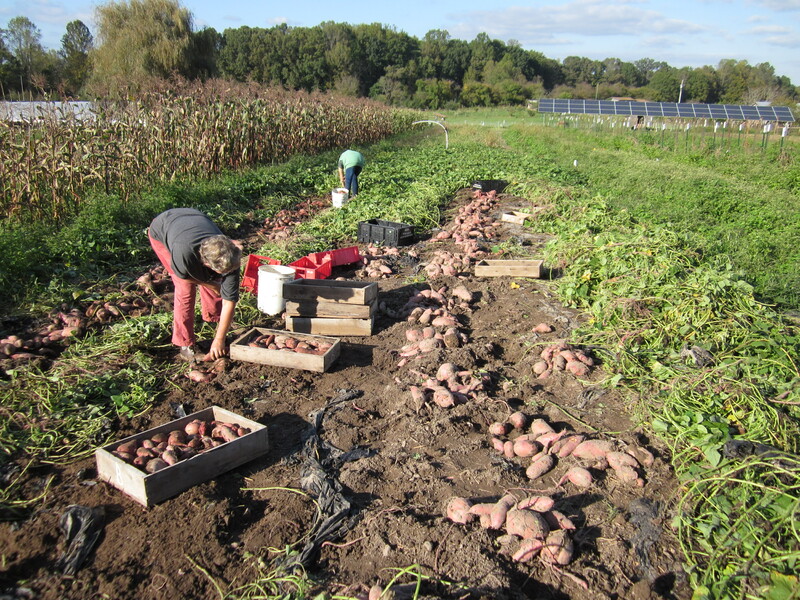 We plant at 6″ (15 cm) spacing, with four rows to a 48″ (1.2 m) bed. People wanting really huge leeks use wider spacings. Leeks can also be planted in clumps of four to six, either at 10–12″ (25–30 cm) in-row spacing for easier hoeing or at 6″ (15 cm) for smaller bunching leeks. We use a special planting technique for our bare root transplants, in order to develop long white shanks, which are prized more than the equally edible green parts. 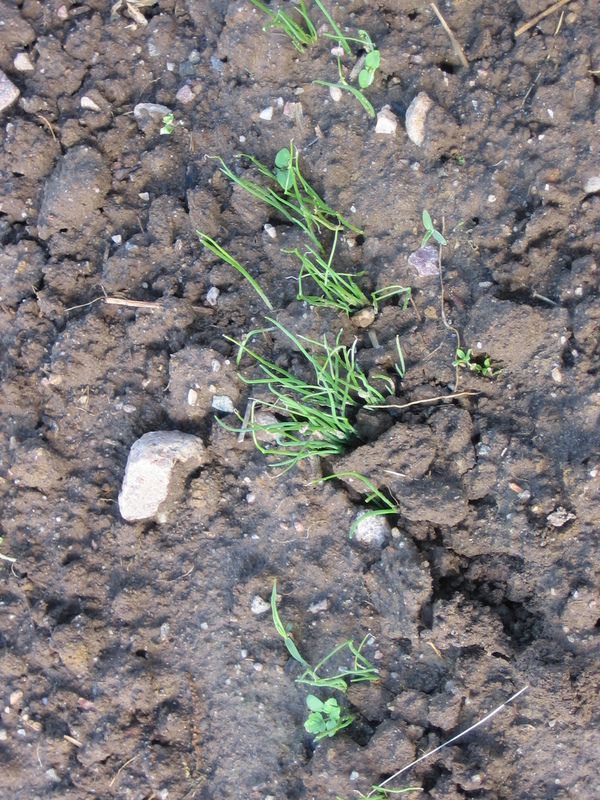 A similar technique can be used for seedlings from flats or plugs. We find it efficient to divide the crew up and specialize in one part of the job. First, if the soil is dry, water it well, preferably more than an hour ahead. 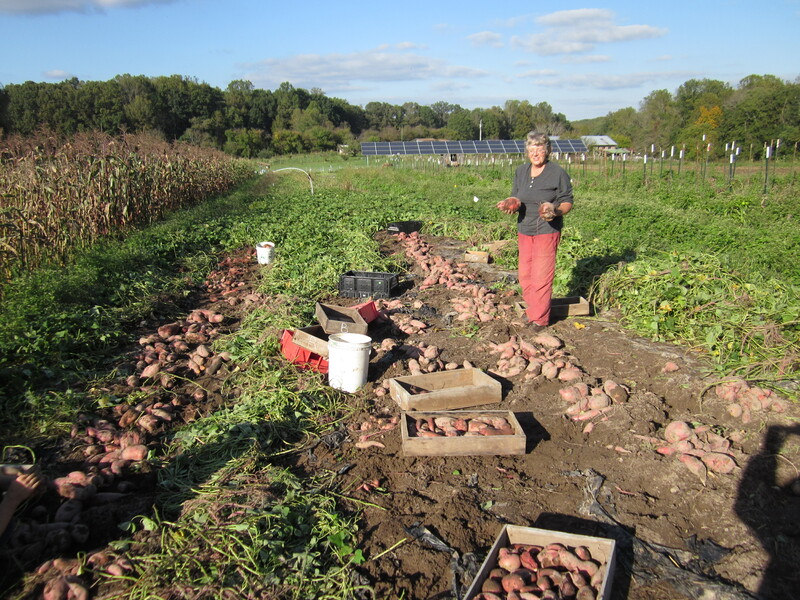 Then one person makes parallel V-shaped furrows, 3″ (8 cm) deep, along the bed. Next, a couple of people make holes 6″ (15 cm) apart in the furrows. Tools for this job include hoe handles, purpose-bought “dibbles” or dibblers, or ones homemade from broken digging fork handles, with the end sharpened to a point. The tool needs to have a diameter of 1½–2″ (4–5 cm). The depth of the holes is determined by the height of the transplants, and is likely to need to be 3″ (8 cm) or more. If the holes cave in, you need to water the soil more before proceeding. Meanwhile another person digs up some of the transplants from the nursery bed and transfers them to a small bucket containing an inch or so of water. We make useful little buckets from one-gallon (four-liter) plastic jugs with the top cut off. A rope handle knotted into holes at the top of the new bucket makes it easy to carry. Resist any temptation to trim either the roots or the tops of the leeks. To transplant, take a leek, shake it free from its neighbors and decide whether to plant it. Discard the ones thinner than pencil leads. 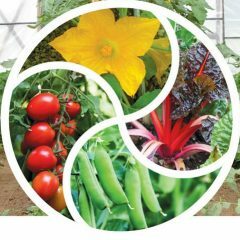 If the plant is a good size and looks healthy, twirl it as you lower it into the hole to prevent the roots folding back on the plant and pointing at the sky — they need to grow downwards. This works best if the roots are still wet and muddy from the water bucket. Bobbing the plant up and down as you settle it in the hole will help a transplant that has slightly bunched roots. If at first you don’t succeed, remove the plant from the hole, dip it back in the water and try again. Soon you will develop this quirky planting skill, and will be able to move along the row at a good clip. 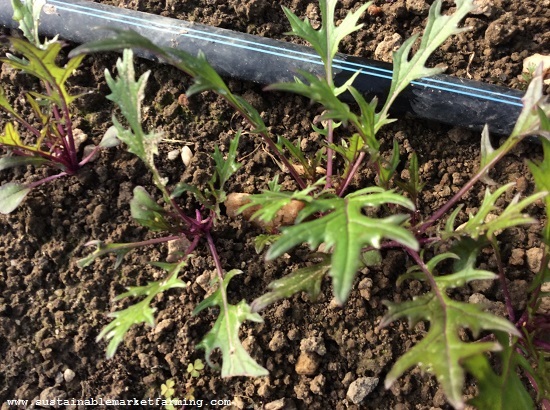 Ideally the tops of the leaves will poke out of the furrow, not more.Get the depth of the hole-making adjusted to suit the prevailing plant height. 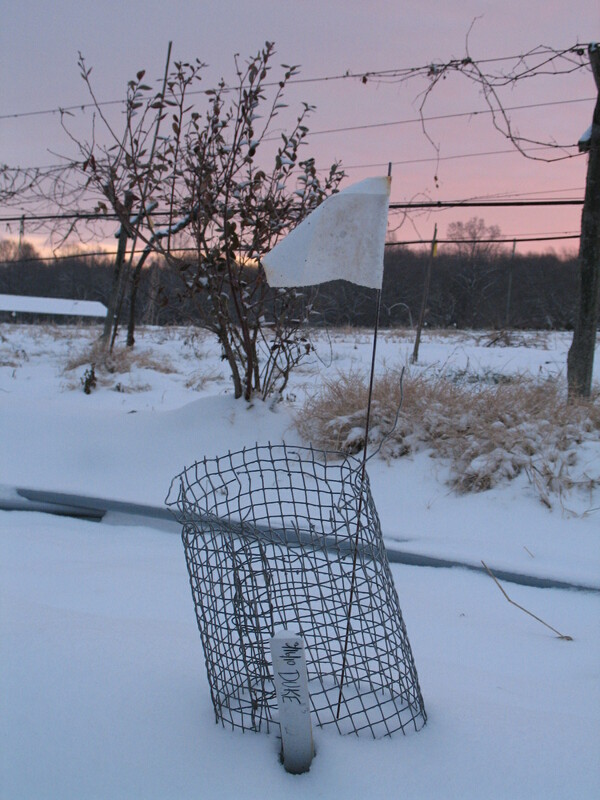 This creates the depth for growing a long white shank. Surprising as it may sound, it is not necessary or desirable to fill the holes with soil (you don’t want to bury the seedlings). The soil fills in naturally as the plants become tall enough to survive the depth. Next someone gently waters each hole, either from a low-pressure hose, watering can or using an overhead sprinkler, once everyone else is out of range. The goal is to water the plant roots, adding only a little soil to each hole. The shelter of the hole helps the plant get over the transplant shock, and because leeks have slender tough leaves, they do not lose a lot of water by transpiration. This means that transplanting in quite hot weather is possible, as is transplanting in the mornings. Onto a completely different subject: the 17-year cicadas. 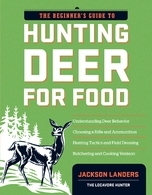 I heard a radio interview and read an article in a local paper, The Hook, about Jackson Landers the Charlottesville author of Eating Aliens, with whom I shared the platform at the Virginia Festival of the Book in March. He spoke about eating the cicadas (not his usual quarry, because these are native insects, not aliens). He’s also on YouTube. He inspired me to try one (given that we only get the chance once every 17 years). I ate it straight up, after rinsing. I chose one that looked recently dead. It wasn’t unpleasant – a mild flavor and a creamy texture. I did wish I’d removed the wings and legs first. I spat out the fibrous bits, but it was no worse than an over-mature snap peas pod. The adult cicadas are dying off now, and the decibel level has dropped.